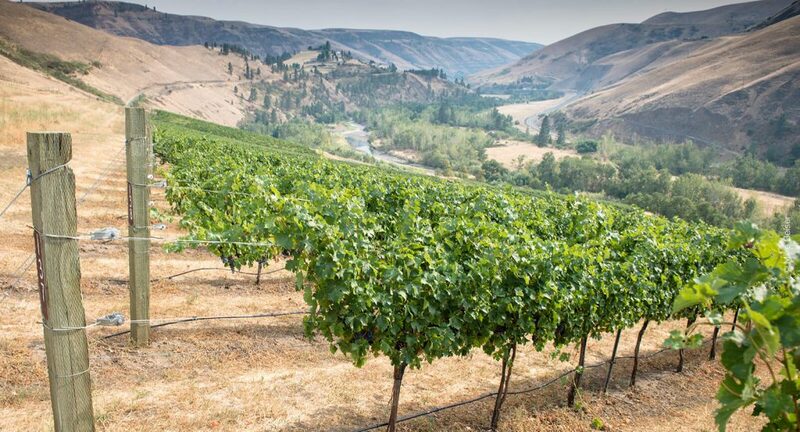 Juliaetta, Idaho—Idaho’s second and third AVAs (American Viticultural Areas) are in the offing, putting more science behind the geography of grapegrowing in the Northwest. Petitions for the Lewis-Clark Valley and Eagle Foothills viticultural areas were announced in mid-April. If approved, Eagle Foothills would be a sub-AVA of the Snake River Valley, while the Lewis-Clark Valley seeks to be an AVA separate from the much larger Snake River Valley and Columbia Valley AVAs. Achieving this will require shearing off approximately 57,020 acres from the 11.3 million-acre Columbia Valley. The planned appellations aren’t exactly well populated. The petitions note that the proposed Lewis-Clark Valley AVA hosts just three bonded wineries—down from five wineries two years ago—in an area of approximately 306,650 acres. Vineyards total a mere 81 acres, with 50 additional acres up for planting in the coming years. Eagle Foothills is home to two wineries and—though it has just 67 acres of vines right now (a density five times that of the neighboring Lewis-Clark Valley)—it stands to become a veritable viticultural hotbed with a whopping 476 acres slated for planting in the coming years. The current application marks the second time both petitions have been submitted (see “Northwest Prepares for New Wine Districts”). A petition for the Lewis-Clark Valley was originally submitted in June 2011, but federal regulators returned it with a request that petitioners address an overlap with the Columbia Valley AVA, a point addressed by the new proposal (see “Idaho Wine Industry Readies for Growth”). Meanwhile, the Eagle Foothills moniker replaces the original name of “Willow Creek Idaho,” which regulators felt wasn’t sufficiently borne out by the accompanying evidence. The new petition cites a property listing, media reports and state highway notices in support of the name Eagle Foothills. precipitate the angst that approval of the Rocks District of Milton-Freewater AVA in Oregon did earlier this year. The pride of the Walla Walla Valley, the Rocks (as the area’s known locally) lies wholly in Oregon but, as part of the interstate Walla Walla Valley AVA, gained fame for the grapes it supplied largely to wineries in Washington state. But many of those wineries, not being in Oregon, lost the right to designate the Rocks on their labels, prompting a petition seeking permission to do so (see “Loosening AVA Regulations”). Regulators proposed allowing, “wines to be labeled with a single-state AVA appellation of origin even if the wine was fully finished in a state adjacent to the state in which the AVA is located,” drawing 41 comments before feedback was cut off April 10. The change was opposed by groups including the California Association of Winegrape Growers, the Napa County Farm Bureau and the Michigan Grape and Wine Industry Council. Dolsby wrote on behalf of the Idaho Grape Growers & Wine Producers Commission in support of the change. Others supported a modified version of the amendment, with Casey McClellan of Seven Hills Winery in Walla Walla, Wash., suggesting use of the neighboring state’s AVA in the case of a sub-appellation located entirely within an AVA that crosses state lines. McClellan’s proposal, seconded in a comment jointly offered by the Oregon Winegrowers Association and the Walla Walla Valley Wine Alliance, met with approval from the Michigan Grape and Wine Industry Council.